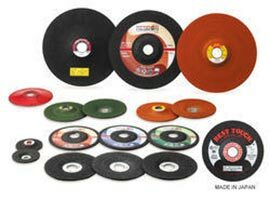 We are a proud Supplier, Exporter and Importer of Resibon Grinding Wheels combining the advantages of depressed centre grinding wheels and resin fiber discs (sanding discs). Because of their flexibility, they put a more grinding surface on the job and will grind faster and last longer. There is also less vibration and operator fatigue with a flexible grinding wheel. We fulfil the requirements of our customer by providing prominent consultancy and give them best product suits them. These wheels are available at very competitive price.